Every year I sketch dogwood flowers. There's a beautiful tree in my front yard at the edge of the woods. The branches drape down to almost touch my easel and I paint the lovely flowers. Sketching dogwood flowers in my front yard this year. Started great, but I overworked it. This is the first dogwood painting I've done I've really been happy with. The flowers look like little dancing butterflies, almost sparkling in the light. Some places are translucent with backlight, some opaque and reflecting shadows. Dogwood sketching tutorial from 2015. I've always secretly believed the Cherokee Indian legend about little people who lived in the branches. They could be helpful if you treated them well and left gifts for them. If you weren't nice to them - well, let's just say they weren't so nice to you! No matter which of the many dogwood legends you believe or don't believe, never pick dogwood flowers. It's just bad luck! This is a simple painting, so keep it simple. 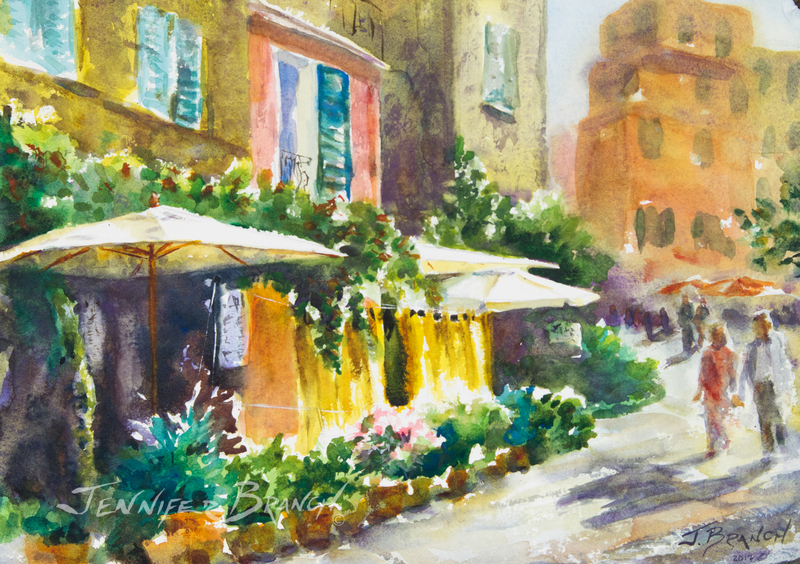 Go wild on the background, but don't overwork the flowers. Less is definitely better in this painting! I begin with a quick wash of cobalt teal. I leave plenty of white paper. 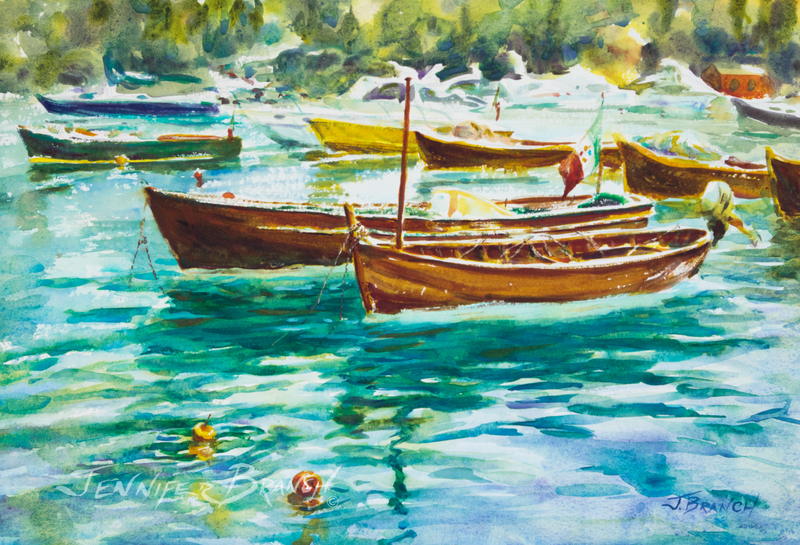 I want a light, airy spring painting. 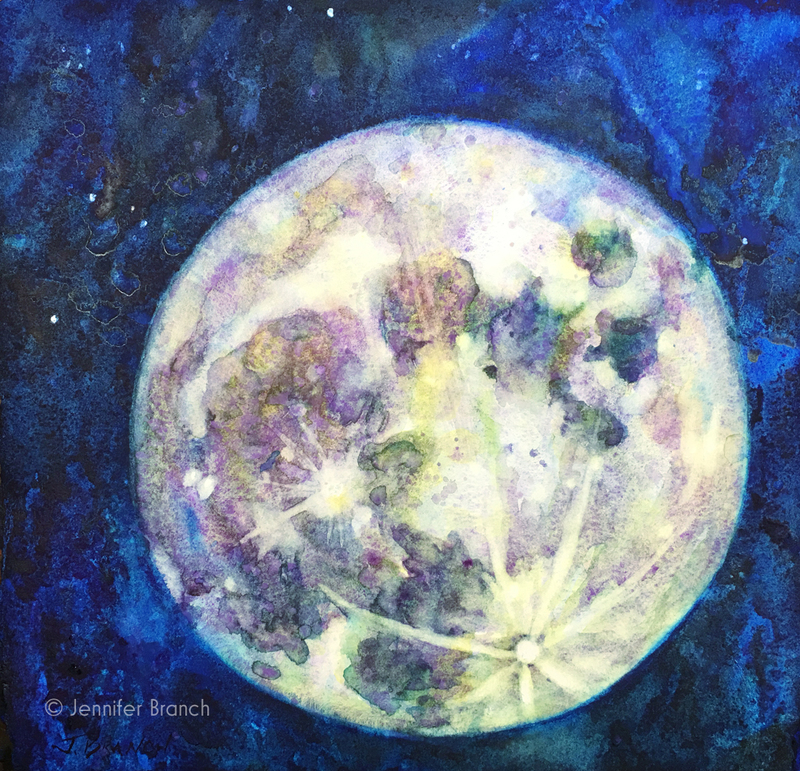 While the cobalt teal is still wet, I quickly drop in cobalt violet and nickel azo yellow. I negative paint around all but the deepest flower shadows. I'll go back and blur edges later. For now, I want the background blurred and the flowers precisely defined. After that wash has completely dried, I start adding a few details. Notice how much paler the color is after the wash is dry versus wet! I darken this layer with the same colors, plus a little ultramarine blue, then let it dry completely again. Never worry about drips and splatters on an area you will be adding texture too. Random accidents make the best texture! I want the bare minimum of details on this. Too many fussy details destroys the grace of a flock of butterflies feel. The pistills of the flowers help bring them into focus, so I start with those. Nickel Azo Yellow, then floating in Cobalt Teal and a touch of Cobalt Violet. That's enough for the first wash on these. Some very subtle touches of cobalt violet and nickel azo yellow in the white flower petals are just enough. This is the stage where too much can ruin the painting, so work slowly with each brush stroke carefully considered. I've deepened a few shadows and blurred some edges. I want to leave most edges crisp with a few blurred like they're fluttering a bit. The background should be left with almost no details. 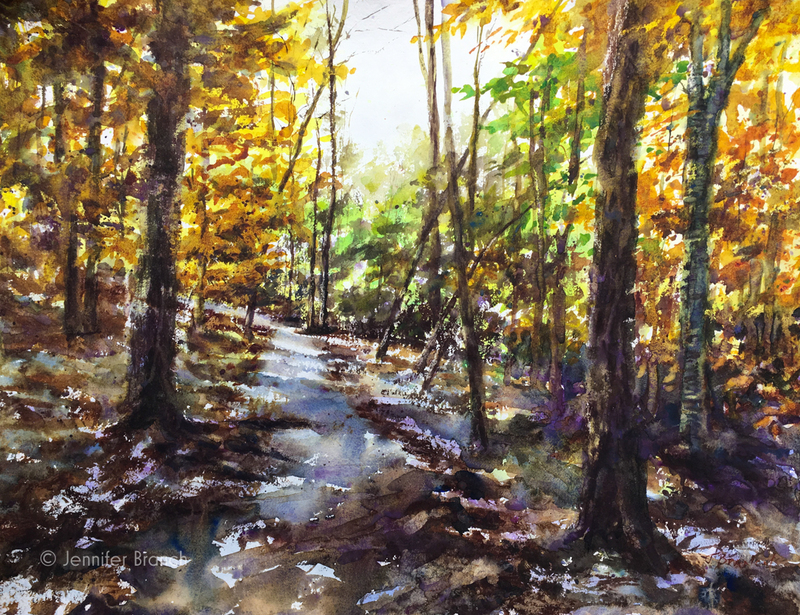 To purchase Dogwoods original watercolor painting, please click! I'm very happy with this dogwood flower watercolor painting. 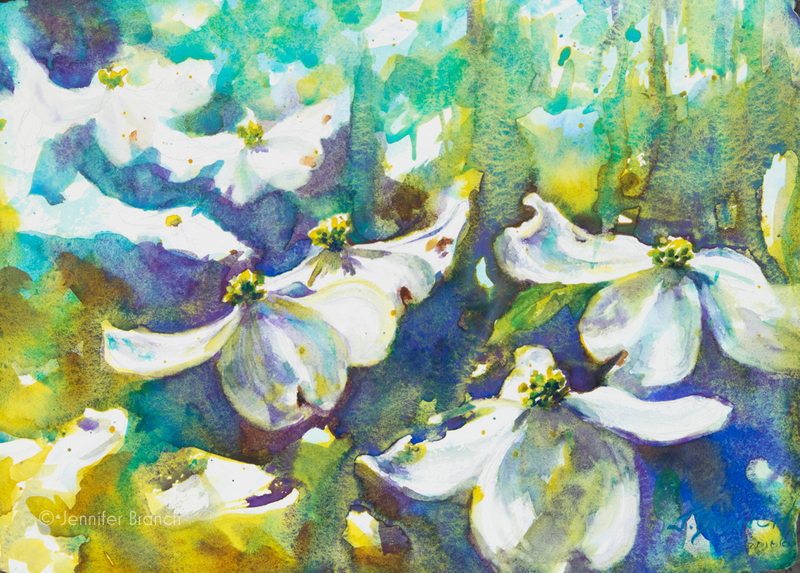 I've painted sketches of dogwood flowers for years, but I've never been completely happy with how they turned out! I like the purple gray dull background of my earlier sketch, but I think the cheerful spring blues and greens suit dogwood flowers better. At least the mood of the day I was sketching it. I do like white flowers glowing in storm light, so next year I might try that as well. I want to tell you about the many stages it takes to get to a finished painting, since I know beginning artists get discouraged when what they see in their head isn't what comes out on the paper! So many potential artists give up when all they need is to relax and enjoy the process. I can't think of a more wonderful way to spend a spring day than painting dogwoods!